I have a special interest in weaving, as it is what I studied during my first two years in Paris. 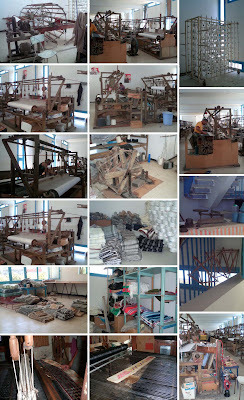 When traveling in Tunisia, we happened to walk past several weaver ateliers which I was very happy to visit! The first one was a cooperative called Al Faouz, not far from the famous tourist destination Hammamet. They were very friendly and welcoming and explained us that most of them have been working there for over 30 years. Some of them were really very old, but still very alert. They work avery day but Friday, which is the "prayer day" for Muslims, and for very long hours as it is really labour intensive work. They do everything by hand, from spinning the wool to set up the loom to the actual weaving. Sadly, as not many young people are interested in that profession, they are less and less numerous and therefore it is more difficult for them to keep up with the amount of work they get. Apparently, they don't have time to do as many things as before, and mainly produce the fabric used for the traditional coat "burnous". They work on big wooden loops that are activated by pedals, so their feet are in very bad condition. It was very impressive to see how fast they work and how quick are their movements! There's a small shop in the basement where they sell the product of their work, there was still some nice cushion covers and cute little carpets. And indeed, in the old Medina, there were weavers in every corner. One was particularly nice and showed us his little workshop and even demonstrated how he was doing. He was in the middle of weaving a traditional wedding fabric. He was selling some beautiful silk scarves made by him. One silk scarf like that takes him about a day to weave and it is so much more precious than those bought in shops! bouhh pour la vf!!! ceci dit ça ce voyage a eu l'ai très interessant!! A good dose of sea, sun and farniente!